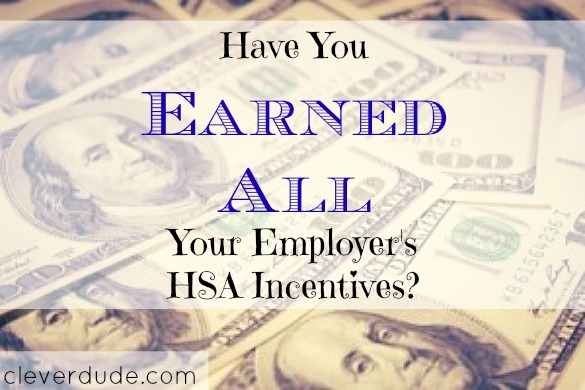 Have You Earned All Your Employer’s HSA Incentives? My medical insurance consists of a high deductible PPO with a Health Savings Account (HSA). It works well for my family because our medical expenses in a given year are low, and my employer offers a generous amount of incentives that can be earned by doing some health related education modules. For only a few hours of effort, I can earn $1100 that my employer will deposit into my HSA. Of course I let most of 2015 slip by without putting in that effort. I was reminded that I had to complete the actions by December 1st, or I would lose the ability to earn the incentives, on the first Friday of November I spent an entire Friday afternoon completing every education module, watching every video, and filling out every health evaluation form needed to earn those incentives. I watched the balance of my HSA every payday expecting to see the incentives deposited. Six weeks later, only half of the incentive money has been deposited. I called the help desk to try to get to the bottom of what was going on. As far as I knew I had completed all the tasks, unfortunately there wasn’t any way of me to tell whether my employer’s tools thought I had completed them. Now being the middle of December, if there was any additional actions that I had forgotten to do, it would be too late. If I had forgotten a step, hundreds of dollars of free incentive money would have been lost. Luckily, the help desk stated their records showed that I had indeed completed all the steps, and that the deposit of the remainder of my funds was pending. They could not, however, answer why some funds had been released, and some had not. I’ll continue to monitor my HSA account for the delivery of my remaining incentive funds. Hopefully I won’t have to call back. I’ve certainly learned my lesson this year, which is my first with a Health Savings Account. Next year I’ll be performing the tasks needed to earn the incentive money as soon as the tools are available in January. That way if any problems are encountered I have plenty of time to have them straightened out. Does your employer offer incentive money for enrolling in a medical plan that has a Health Savings Account? Have you ever forgotten about them and left free money on the table? I think that HSA accounts are forgotten about/unknown in general by most people. For young people with low expected healthcare expenses it is a GREAT way to get some “free” money through tax deductible contributions. Why spend money on premiums for something you won’t use when you could be protecting your future self. It’s a win-win. This is the first I’ve heard about incentive money to own a HSA, that’s awesome! @Josh – I had two new people start in my department this year, and I was explaining to him how the HSA works…..if I hadn’t mentioned that he should think about an HSA, he would have signed up for the most expensive insurance and not done an HSA. He’s young, and doesn’t ever get sick. It’s the PERFECT time for him to be saving up for future medical expenses!